For the FIRST time ever, FIRST-time subscribers can buy their FIRST month and get their second month FREE! Offer Details: When you use promo code “BOGO” at PaperPumpkin.com, you'll pay the regular price of $19.95 USD/$26.95 CAD and get their second month for FREE! If you subscribe with the promo code between now and September 10, you will pay full price for the September kit and get the October kit free. If you subscribe between September 11 and October 10, their first kit will be the October kit and they will get the November kit free. Don't miss this great offer, subscribe now! Have you tried Paper Pumpkin? Right now is a great time to get in on the fun! Buy your first month and get your second month FREE. Get your kit and share the fun with family and friends. Paper pumpkin makes a great gift, sign up and give the free kit as a gift! I love a great BOGO deal! 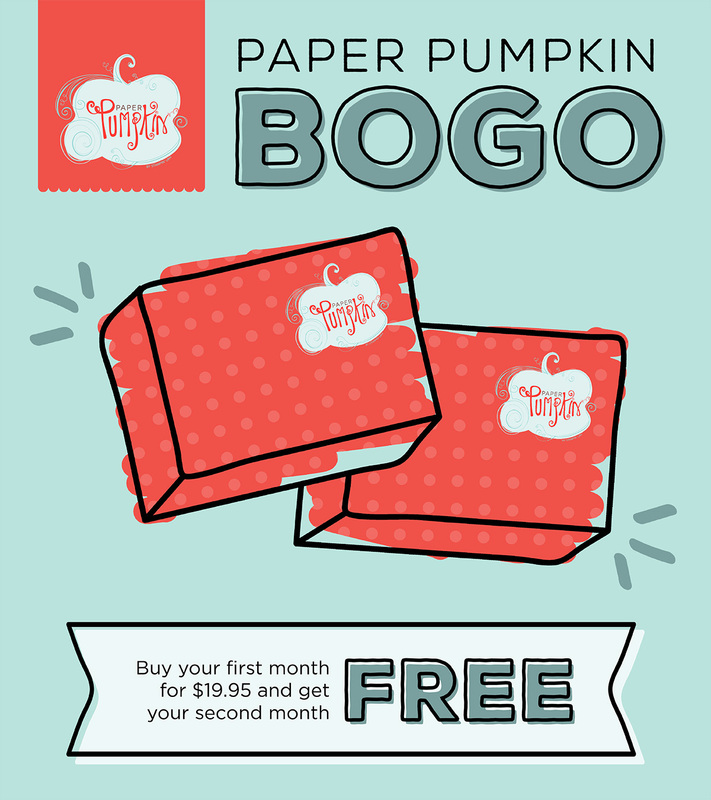 Right now you can buy one month of Paper Pumpkin and get the second month FREE! Use promo code BOGO at PaperPumpkin.com and select me as your demonstrator. Offer ends October 10. Fun and creativity in the box. Unbox, unwind and have fun! For more fun and creative ideas contact me! Want to make amazing projects without the prep work? Meet Paper Pumpkin-a crafting subscription program by Stampin’ Up! Creative is Inside the box! 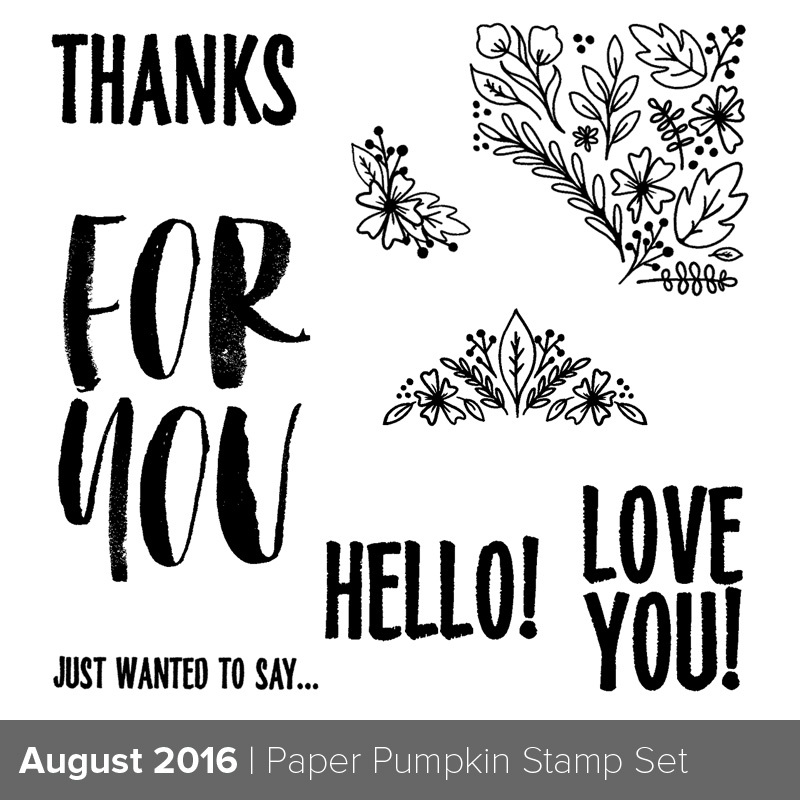 To share in the excitement of this fun crafting subscription, Paper Pumpkin decided to give a sneak peek of the stamp set included in the August paper Pumpkin Kit! Several cards in the card kit for August! Inside each box you’ll find all the stamps, ink and paper you need to make a fun, paper-crafting project. Everything is precut and ready to go. We do the Work! So you can skip to the Fun! Whether you’re a stamping pro or a newbie, we make it easy to relax and enjoy your favorite hobby-crafting. Just imagine having the time to be “that person” who makes all the cute things and makes it look easy!